I held off a long time on ordering the Man O’ War cigar since it seems to be mail order only and let’s face it most cigars that are limited to some of the big mail order houses are pretty awful. But I caved in when cigar.com had a special The AJ Fernandez Sampler for 29.95. Besides the Man O’ War you also got a San Lotano Oval, Diesels and a few Man O War Brands. This is something I knew I would enjoy so at that price I could not pass it up. Pre-Smoke: When I took this cigar out of the humidor I sneaked a sniff of the foot and was blown away by the overabundance of mocha. I left it in my shirt pocket as I had sushi for lunch with a couple of friends and at the end of lunch when asked what cigar I had with me today I told my friend to take a sniff. He too was blown away by the strong notes of mocha and my other friend agreed as well. So we left lunch and headed to my smoking spot where a cold breeze was coming off the water. 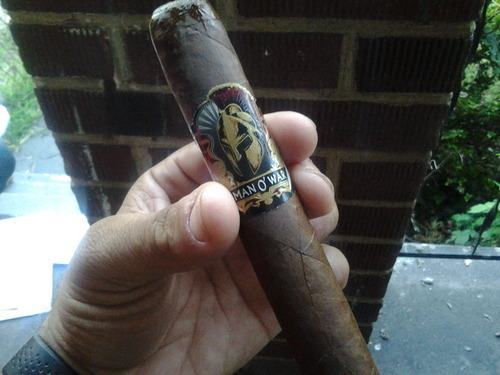 The wrapper of the Man O’ War cigar is very chocolate in color, with some very slight veins. The wrapper and pre-light draw offer mocha notes as well. Smoke: Mocha, that is what this cigar is all about. It is a note all the way through the cigar. It is the aroma of the smoke and it is the finish. Also during the smoke you pick up some nuts and at the end it does become a little earthy but none of them compare to the mocha that at times can become overwhelming if you are not a fan. I however am. Now when I reached the half way mark of this cigar the flavors change to peanuts and spice followed by large plumes of smoke. Towards the end you could taste Vanilla, anise, and cinnamon that appeared to be the flavor profile balancing the cigar’s out. Wait a minute The Man O’ War changes yet again and begins to calm down some as the spice retreats to the background. It finally ended with flavors of bread and honey complement the other kitchen spices that are taking the forefront. Wow the burn line despite the strong breeze was acceptable. I never needed to touch it up, and I never needed to relight it. Overall: I wish I did not wait this long to pick up this cigar. I also wish my local JRs had the cigar. Although I will add this disclaimer; if I did not like mocha this cigar would have been overkill defined.